We’ve arrived at Marrakech, a city of chaos. Disarray as a way of living. Pedestrians share the road with all types of vehicles: cars, bikes and carts pulled by horses. Helmets are optional here. Not the veil in girls, though. The heat justifies it. We’re over 40º celsius, sky doesn’t know a thing about clouds and wind burns our faces. Water is of essence; stoping in shades too. It is difficult to figure how people can live in here. In the hostel everyone is kind, which is normal, we’re tourists and costumers. In the streets, the sympathy of some is excessive. Mistrust and get it right. What they like about you is inside your wallet. I’ve noticed that half of the people here is under their twenties, a phenomenon that I don’t get. I guess that when they grow up they’ll want to leave. Lunch brings us back to life. When we leave the restaurant we already know that getting lost here is not a choice. It’s the only choice. This is the nature of Marrakech. Roger, the writer of these short observations, contemplating the scenery in the city centre. 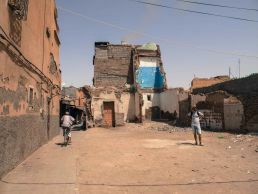 Marrakech has another side beyond the old town, an opposite brother with whom he only shares the surname. The modern part of the capital is completely westernized. Banks, restaurants and shops of universal brands share spots with paved roads and avenues. There’s even parking meter, and that says it all. Where there is more tourism, there is more order. The signs of national identity are still present: the flags of the country —and references to the King— are constant and well visible. In the public gardens, a small disillusion: after a long walk we find out there’s only arid land ahead. It’s probably just summer. I’m surprised with the choice of football shirts in the streets: Madrid, Atlético and Barça are well represented. Fernando Hierro and Movilla steal the spotlight to Cristiano and Torres for the first two. In the case of the blaugrana, not a trace of Messi: Neymar wins the round. 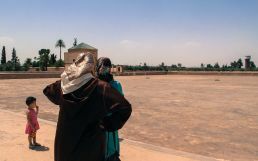 A family contemplates the empty pond in the Menara Gardens, Marrakech.